Many years ago, I wrote an article titled “Beneath The Mask” published in Western & Eastern Treasures…. and also the unedited version is published on this web-site. This was simply just an experiment to prove/validate many concerns. (As a prelude to reading this article/report, I recommend reading it before continuing... CLICK HERE to go to BENEATH THE MASK). The acquired information would be logged in to the eternal memory banks, for possible ‘real-time’ future use. And that day would arrive, nearly a decade later; the afternoon of Easter Sunday… April 12, 2009. The location is a 3rd Seminole-Indian War site that had a U.S. Army Fort built upon it; with active occupation that spanned from Dec. 1849 – Aug. 1850. Virtually no other human travel existed upon this property since this time period. A few weeks prior, the recovery of a U.S. Quarter-Eagle gold coin…… a 1843 ‘O’rleans, small-date, crosslet ‘4’, die-break specimen, VF-30……. is what spawned the ‘mania’ to commence digging pits……. utilizing a concerted scientific approach/methodology. 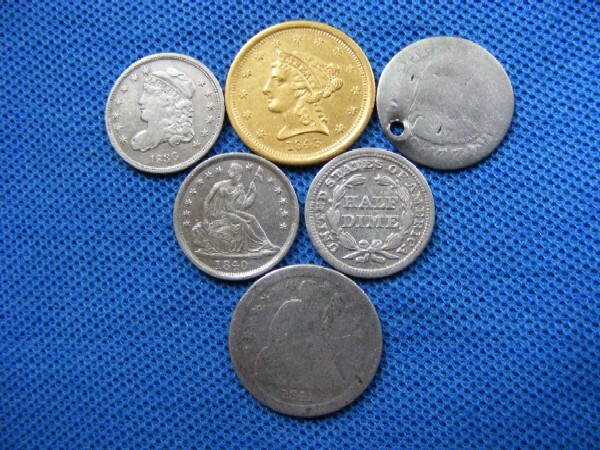 Leading up to the recovery of the gold coin…… were the recovery of MANY circa-1849/1850 items such as; .69 & .54 & .36 cal musket balls, ‘buck-n-ball’(s), approximately 100 percussion caps, many “A” Artillery coat & cuff buttons, “I” Infantry buttons, Kepi & Great Coat and New York Staff Militia buttons, other various military buttons, non-designated military buttons, other uniform insignia symbols/ornaments, a sword pommel, a flintlock hammer assembly, other gun parts, one rosette, a scabbard tip, a toe-tap, 3 Half-Dimes, 1 Half-Reale, 1 early Seated Dime (no copper coins; hence, the definition of ‘Specie Payment’) and many more items. Many of the areas (in one large field) were fairly heavily littered with cut square-nails. And THIS would be the ‘clue’ as to where to start digging pits so as to mechanically unmask targets. With certainty, the detector could positively identify where 2 structures once stood… approx 30 feet x 40 feet dimensions. The metal detector would be the tool INITIALLY used to locate and validate the era of the area; then subsequently utilized to find the higher volume iron nail content areas. This is where the first pit was dug. Photo’s do a lot of justice. Definitions/explanations instill the ‘mindset’. For the tuition expended; this is where the priceless education comes into play. Using the audio presentation and the depth bar-graph of the F75, one of the specific areas presented a iron low-tone ‘machine gun fire’ continuous audio report…. with the bar-graph depth gauge indicating a nearly continuous shallow depth reading. First evolution; turning off the metal detector, then spreading out a 8-feet by 9-feet old bed sheet next to the localized area of interest. Next would be to use a regular-grade large shovel. A 5-feet by 5-feet pit would be dug; incrementally. First, the top 2-inches of topsoil would be removed. This would remove the grass and associated grass roots. Detecting this 2 inches of topsoil yielded nothing…… as to be expected. Now, things start to get interesting. Sweeping the coil in this 2 inches deep pit (5-feet x 5-feet) yielded absolutely nothing. No non-ferrous targets. Only the continuous low-tone ‘machine gun fire’ audio output. This is somewhat of a surprise, as there should have been one or two non-ferrous targets ‘starting’ to come to light….. electronically, by detection. Not so. Sweeping a fairly large magnet in this 2 inches deep hole yielded nothing; not even iron oxide (rust) flakes. Next, would be to dig down to about the 5 inches depth mark…… removing/excavating the dirt and placing it on the old bed sheet,,,, then spreading it out evenly over a large area. Now……… sweeping the coil over the excavated dirt on the bed sheet……. would result in many iron reports…… yet, ZERO non-ferrous targets reported (remember this). Then, sweeping the coil in the dug pit…..and STILL no non-ferrous targets. This is quite unusual. Sweeping the magnet in the pit yielded 2 nails and many rust flakes. Now, , , using the detector and the magnet, the next logical sequence of events would be: to remove ALL iron items in the excavated dirt on the bed sheet. . . that was evenly spread/distributed and approximately 1 inch deep with excavated dirt. Approx ten square nails were removed…… and a fairly large volume of iron rust flakes were extracted. This is a difficult process, as the detector needs to be placed in the all-metal mode….. and each iron item must be located and magnetically removed. The large magnet is fairly powerful; yet, it is a requirement that the iron targets must be ‘touched’ by the magnet in order for them to be picked up. Continuing to sweep the magnet through the dirt…. and some of the targets that were stuck to the magnet could easily break free and be lost in the dirt again; hence, the difficulty of performing this entire evolution. Utilization of a fairly fine-screen sifter was proven to be a feudal attempt, as the nails would somehow manage to vertically slip through the screen….. including nearly ALL of the iron rust flakes; rendering the sifter useless. Now, painful and shocking ‘education’ starts to happen. Sweeping the coil over the 1 inch deep iron-free dirt on the bed sheet…. and 2 non-ferrous targets are NOW (finally) detectable. One was a .20 Cal lead BB…. and the other was a sliver of lead (appears to be a badly deformed/hit buckshot ball). With the bed sheet dirt only approx 1 inch deep…… it is hard to believe that these targets were NOT detectable…. before the iron was removed from this shallow dirt on the bed sheet. Continuing to dig the 5 feet by 5 feet pit…… another (approx) 4 inches more of soil were removed and evenly & widely distributed on the bed sheet. This brings the pit to nearly 9 inches in depth…… and also brings the bed sheet to approx 2 inches depth of dirt. 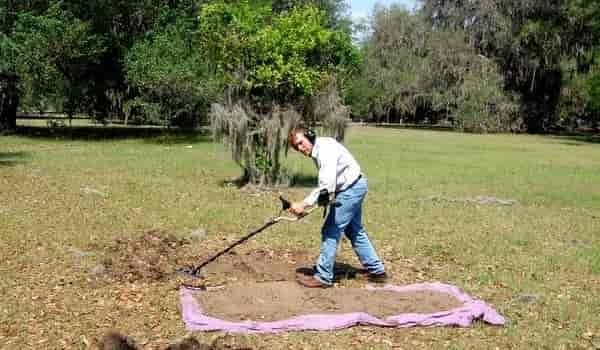 (((Remember, the bed sheet size is approx 8-feet by 9-feet….much more surface area vs. the 5 feet by 5 feet pit; hence a ‘thinner’ depth excavated dirt pile))). The detector would only report a continuous iron tone extremely rapid machine gun fire audio (very, very fatiguing); and……once again……..NO non-ferrous items on the bed sheet. Utilizing just the magnet through the dirt…… then the detector and the magnet in concert, yielded nearly 30 more nails and a countless volume of little slivers of rust flakes. Now, (SHOCKINGLY) switching the detector over to the ID mode and sweeping the coil over the shallow 2 inches deep bed sheet dirt that is now sans iron/ferrous….. and the bed sheet dirt reported MANY non-ferrous targets. RESURECTION! Finally, these masked and silently masked targets came to life. A couple of .36 Cal musket balls, several fired/splattered lead musket balls, part of a wing off of a hat-plate and a large “A” Artillery coat button circa (1821-1844).…. a bit larger than a nickel. Good thing it wasn’t the size of a penny……….. or even smaller; the size of a dime. And all of the lead items had just as much…. if not… more mass/weight than Artillery ‘A’ army cuff buttons. What is hard to believe (and priceless education) is the fact that NONE of these targets were detectable in just 2 inches of dirt depth…… on the bed sheet……….. UNTIL the mask was removed. EACH one of these targets were/are detectable to ranges of 11 inches – 12 inches in the air….. or in clean dirt. Sure, a 5” DD coil may have detected (via better adjacent target separation) some of these non-ferrous targets in the 2 inches deep excavated dirt pile; but, no need to change coils…… as the ‘mask’ was going to be removed, regardless. And with THIS much labor expended, the intent is not to recover only some of the non-ferrous targets; rather, ALL of the non-ferrous targets. 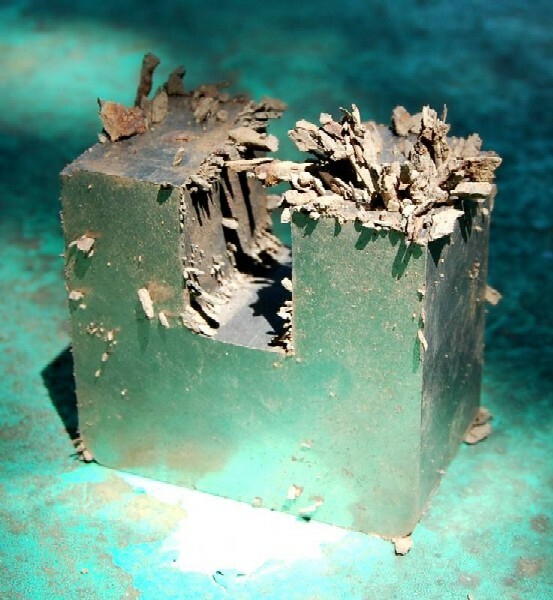 Also; To simply dig a 1 cubic-foot volume of dirt out of the ground…. then spread it around….. may not be the answer….and may not work. All-metal mode and strong magnet required. In a little 5-foot area……. There were 9 non-ferrous targets that were completely masked. So, I ask you, How far (measured in inches) does a coil have to swing (within the confines of a 5-foot area)….. with 9 non-ferrous targets in it…….. masking aside……. for you to detect a non-ferrous target? To make matters worse; the coil of the detector was then dunked into the 5 feet by 5 feet by nine-inches deep excavated hole. ((Up to this point, this had not been performed yet)). Sweeping the coil………. once again……… a tremendous amount of continuous audio output iron low-tones emanated from the headphones. So just exactly how deep do the targets stratify? How deep are the excavation process requirements? The data presented herein is incomplete. Only a depth of 9 inches was performed. With certainty, there are many more non-ferrous targets still being masked in this pit. Doing the math once again; NOW how far do you need to swing the coil in a 5-foot area to detect a non-ferrous target….. masking aside? This is the painful truth. So, what does all of this mean? It is the legitimate justification in testimony….. via scientific quantification and qualification….. of the fact that: Over 95% of the good targets we choose to find/recover…. are still in the ground….. and are masked/silent-masked or too deep for recovery. At this particular Fort…. even with well over 100 ‘keeper’ non-ferrous targets having been recovered over 10 acres of parcel….. it is safe to say that only approx 5 percent of the good targets have been recovered. Yes; 95 percent of the good targets remain masked. Yes, only 1/20’th of the non-ferrous good targets have been recovered. A 5-foot x 5-foot (25 Sq ft.) sampling…… vs. about 100,000 Sq ft of property…. is hardly a dent. It is safe to say that a concentric coil CZ…… in these nail-infested sites……. will recover approx 2.5 percent of the good/keeper non-ferrous targets. A elliptical DD coil equipped detector, such as the F75, will find approx double the amount of non-ferrous targets over a comparable concentric coil equipped detector. This is to say that if a CZ finds 50 targets……. The F75 will find approx ANOTHER 100 percent more…. by finding another 50 good targets……. 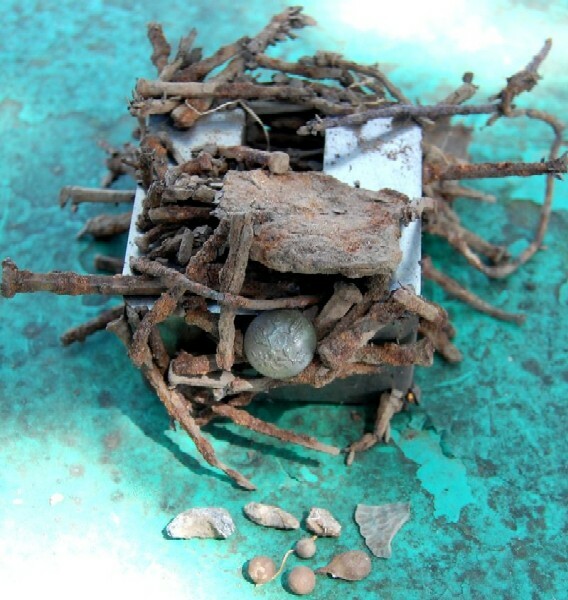 but, for a cumulative total of (2.5 percent + 2.5 percent) = 5 percent of the good non-ferrous targets in most typical & common nail-infested sites. Should a metal detector be used as a distant secondary tool to simply ‘zoom-in’ on the hot spots? Honorable mention needs to be given to the fact that plenty of non-metallic items were also recovered. Items like black glass & pottery shards, clay pipe stems, clay marbles and a textbook perfect Indian arrowhead. Electronically, we have come a long way….. with the advent of the F75. It is aa approximately 100 percent (or double) performance leap in technology…. in these iron-laden nail-infested areas. Could we ‘double’ current-technology performance again? In the past, it was common practice to ‘run’ away from….. and do everything possible….. to avoid these areas of nail beds. It was always assumed that they contained nearly all iron nails….. and maybe one or two masked targets…. at best. Collectively, the advent of the elliptical DD coil coupled to a very rapid microprocessor has revolutionized ‘where’ and the ‘way’ in which we hunt. This epiphany is the beginnings of a new age of ‘discovery’. * Targets/items were found to a max depth strata/range of 17 inches. * Between 16 and 17 inches….. targets were sparse/thin/minimal. * Between 5” – 7”….. targets were sparse/thin/minimal. * Pique target activity/density stratified in the range of 12.5 – 14 inches. * Fifteen (15) non-ferrous targets per 5’ x 5’ area. This is ‘overall averaging’…. and would repeat itself time-and-time again. (Some smaller excavations/pits were dug, which, in turn, would support this data). Ratio = 7:1 There appears to be concrete evidence of recovering 7 ferrous/iron targets (usually cut square nails) to one non-ferrous target. All items recovered; ferrous & non-ferrous were all era/period 1849 & 1850.